The Olive Gate Guest A Reborn Classic historic home in the downtown of Paso Robles. 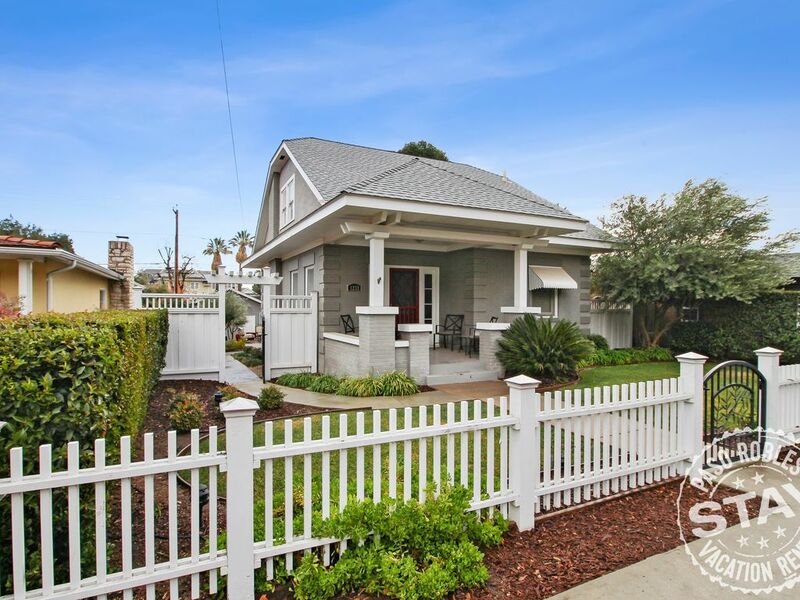 This 1920's home with welcoming red accents throughout is completely remodeled on the inside in contemporary style, leading to a sense of playfulness and fun found in few rentals. This Paso Robles classic comes with stylish furniture and artwork that makes you feel as though you are in a designer update on a classic home. One bedroom downstairs off the living area and two bedrooms upstairs. The large backyard with multiple patio seating areas makes this the perfect home for entertaining friends and enjoying a Mid-Coast evening in the comfort of your own private space. Come enjoy all the comforts and convenience of home in a memorable location. An easy stroll past picket fence yards to world class restaurants, shopping, wine-tasting rooms, antiques stores, and movie theatres. A visit to Paso Robles and The Olive Gate is immersing yourself into our friendly, simpler lifestyle. Hospitality is the town's middle name. Return from your visits to the various wine trails, farmers' market, or Mid-State Fair and be greeted by the friendly, bright red front door. Paso Robles Vacation Rentals® is your local expert! Please contact us with questions about restaurants, wineries and fun things to do on the central coast! It was a fantastic stay. Very happy with the house, amazing location, and great set-up for a weekend getaway. Amazing weekend with five college friends celebrating over 20 years of friendship. We laughed, we cried, and felt right at home. This was the perfect place for our weekend of dinner at Fish Gaucho, wine tasting at Pelletiere, Tooth and Nail, and Tablas Creek, as well as our end of day mineral hot springs adventure. The house was very clean and spacious for it's cottage size. Others mentioned the older windows as an issue and I would agree that this is something that should be addressed at some point. We will definitely be back for more! Perfect home base for our first trip to Paso Robles. Unbeatable location, just 2 blocks from downtown Paso, and easy access to the wineries (10 min) and coast (30 min) along Route 46. The house is well-maintained, immaculate, and supplied with plenty of towels and linens. We loved the attention to decor and whimsical art. Excellent quality everything: beds were VERY comfortable, kitchen utensils and pots/pans were definitely better than average quality. The backyard was spacious and we could imagine spending a lot of time there in warmer weather. The upstairs stairway is somewhat steep but wasn't a problem for any of us. We didn't realize that there is no laundry machine; it was not mentioned in the book of house info. For this price, I would've expected laundry machines. Also, would've appreciated clearer info on what to do with recycling/trash/compost. We had to download the "Hospitality" app on our phones to check-in and check-out, and to send messages to the manager. I had sent a message and questions upon check-in (it was a Saturday), but did not get a reply. Would've been good to get an acknowledgement of that message. Overall, a terrific gem of a house, and it made our trip to Paso just wonderful. Thank you! The house was charming, comfortable, and in quiet location, the kitchen was well equipped. We enjoyed our stay. Olive Gate was fine. 3 rooms 2 baths, a couch that pulled out. Well stocked kitchen and amenities. House is older and has nice character, a bit drafty- but nothing terrible. Located in a great area and can walk to everything within 2 blocks. Would stay again. This house was the perfect size for 6 adults for a weekend in Paso. It's in a great location as you can easily walk to the downtown square. The backyard is awesome with plenty of seating areas. The home was clean and had everything we needed. We couldn't find a couple light switches and the mgmt company called back within an hour on a Friday night. The process was easy. We'd definitely recommend staying here and will be back.